Ever since we got involved with house sitting back in 2013, we’ve seen nothing but growth in the demand for professional house sitters. For us it’s now a way of life and we house sit for at least 10 months of each year. We leave some gaps for travel adventures, made all the more affordable because we save so much on our accommodation. However, that’s NOT why we are house sitters. We house sit because we can help other pet lovers enjoy their travel adventures too! It’s an exchange, based on trust not money. For home owners with pets the benefits are undeniable. No more heart-breaking moments as you leave your dogs or cats at the boarding kennels. No more worrying who you can get to check on your guinea pig or budgie. Some pet owners have been travel restricted by their love of animals. They can find a house sitter to look after any pet type and even livestock. All this has got to make for a better world, hasn’t it? We are so passionate about house sitting that we decided to share our knowledge with just about anyone who wants to listen. 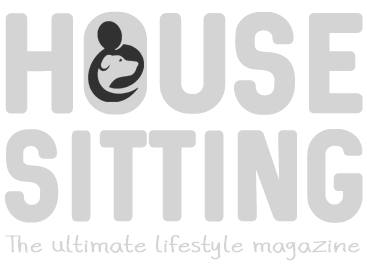 We made that a little easier by creating a free bi-monthly publication – House Sitting – The ultimate Lifestyle Magazine. You’ll find lots of help and advice, and useful getting started guides. But, just in case you’re still a little unclear about the concept, let me explain quickly here. What is house sitting and what does a house sitter do? A homeowner entrusts their property and pets to one or more house sitters. The house sitter gets to live in the home free of any charge, in return for their free home and pet care services. But, it really mustn’t be seen as a free holiday! House sitting comes with responsibilities. There will usually be daily house sitting tasks and duties. You’ll be looking after someone’s most valued possessions and their treasured pets – that can’t be taken lightly. The pay-off is that you’ll have the time to live like a local in a new and interesting location somewhere else in the world! You can stay for a few days, weeks, months or even longer, really enjoying the destination you have chosen. How does house sitting help the home owner? A home owner can then confidently leave their home and pets in the hands of their professional house sitters, who will take care of everything while they’re away. Most importantly the pets are loved and cared for with no interruption to their daily routines by other pet lovers. How do I know if house sitting is for me? Which is the best house sitting website to join and where will I find the best house sitting discounts? Over the years there have been many house sitting platforms that specialize in matching home and pet owners with house sitters, and a few have grown to become the best known house sitting platforms. Companies like TrustedHousesitters, HouseCarers and Nomador now lead the way in providing exceptional service for their members. But you might decide to begin with a smaller house sitter platform where you’ll have less competition. Or, you might want to try a regional website. We often use these ourselves too. The more opportunities the better! This post is regularly updated, and includes the cost of joining house sitting websites with links to EVERY reputable house sitting website around the world. How do I make sure nothing goes wrong? Getting expectations clear at the start is key to a successful house sitting gig for all parties. It needs to be win-win-win for everyone – happy home owners, satisfied sitters and contented pets! Do you want to know more about how to become a house sitter? If you’re new to house sitting, then take your time to decide if it’s right for you. There’s no rush… this concept is just going to grow and grow. It’s like we’re riding the exponential curve! If you’ve got any questions you’d like us to answer, pop them in the comments below or send us a message on our contact page. We want to help you become the best house sitter you can be. Are you paid to house sit? I’m confused as to the rewards of doing this, besides the obvious like travel to cool places etc. How are you to finance these trips if you’re not paid to provide the house sitting service? Hi Nicola. There are some instances (usually in your home country) where you can find paid options for pet sitting (take a look at Rover.com). You need to think about work visas if accepting payment in other countries. I do know other house sitters who charge for their services. However, most international sitters offer their services for free. The exchange element, free rent for home and pet care services is payment enough for many of us. We finance the trips in the same way that we would finance a vacation – house sitting (contrary to what some believe), doesn’t provide free world travel. It just helps with the accommodation aspect of traveling. Many of us have roaming incomes or work as Digital Nomads in conjunction with house sitting. We teach English online, which we can do from anywhere. We work 30 hours a month each and this pays for our travel. The rewards for us are that we’re living location independent, we travel extensively between our sits, we get to help others enjoy time away by looking after the home and pets, and we work when and wherever we want. If you use house sitting as a short term vacation option, then you have to consider the costs of getting to the property and living there, but you could possibly stay longer and you get the chance to live more like a local. House sitting works particularly well for people who love travel and pets – the two sort of go hand in hand. Hope that helps. teaching English online sounds like a great idea! are there better companies to work for? I’d love to find out more about this idea. Ian here. Yes, teaching English online is a great way to earn a flexible income, and doesn’t require you to be in any particular location. We’ve taught online for a Chinese company for over three years now, and have done so from many countries. There is a section about companies you can work for, and a link to a great article about many of the options you have. take a look at the pdf, and get back to us if there is anything we haven’t answered for you.